Unrelenting rains cause a mudslide in La Conchita. California mudslide prompts frantic rescue efforts. A nail-biting rescue from a flooded California viaduct. Gallery: Snow, mudslides and flooding across U.S.
LA CONCHITA, California (CNN) -- Searchers used their hands to dig through thick mud and debris Tuesday in search of survivors after a mudslide devastated this coastal community northwest of Los Angeles and killed at least six people. Another 13 people were missing, including three young children, authorities said. More than 600 rescue personnel from about 20 different agencies were taking part in the search, concentrating on a 30-foot mound of mud that buried 15 homes. Another 16 homes were damaged. Dogs trained to find survivors and cadavers were aiding in the search. Rescuers were also using listening devices to try to detect any signs of life beneath the rubble. Diggers were still finding voids in the mud large enough for people to have survived. Rescue crews will continue searching nonstop for those missing for "at least another 24 hours," Ventura County Fire Chief Bob Roper said at 5 p.m. (8 p.m. ET). "This is still a rescue incident," Roper said. "We have not given up hope." Ten people have been pulled out alive, eight of whom were taken to hospitals. Two of those were in critical condition, Roper said. The last faint sounds were heard coming from the rubble between 2 a.m. and 6 a.m. Tuesday. "That's a positive indicator to us that there may be somebody, something making a noise down in the rubble pile," Roper said. "That's the reason why we're not giving up hope." Roper also sought to end rumors that authorities knew in advance that the mudslide was going to occur Monday afternoon. He said sensors on the mountainside detected nothing before the bluff came crashing down. "If we did, we would have ordered the evacuations," he said. Roper said media reports that the town was being evacuated at the time of the mudslide were wrong. Resident Drew McCrary said he was walking down the nearby beach when the mudslide occurred. "We had no warning," he said. "We had no warning whatsoever." Authorities blamed the landslides and flooding on five days of heavy rain, which have resulted in nearly 20 deaths in the state. Frank McCarton, chief deputy director of California's Emergency Services, said heavy snowfall in the state's northern mountains could cause further problems when warmer weather comes. "The melt-off of this particular snow will be a concern for us as emergency managers," he said. Flood warnings from the National Weather Service remained in place for parts of Southern California late Tuesday, as well as areas to the east in Nevada, Utah and Arizona. South of Los Angeles, authorities Tuesday began evacuating residents in San Juan Capistrano -- famous the swallows that there return each spring -- after rising floodwaters in the San Juan Creek carried away part of the creek's concrete bank. Assistant City Manager Bill Huber said city crews were placing large boulders and dirt into piles to shore up the levy wall. "The floodwaters doubled in height and speed last night and the crews couldn't keep up with it," he said. In San Marcos Pass, not far from Santa Barbara, nearly 24 inches of rain fell between Thursday and early Tuesday. Dry weather was forecast for Wednesday. 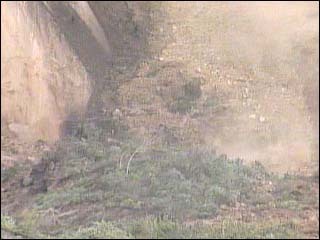 Monday's large mudslide came shortly before 1:30 p.m. (4:30 p.m. ET), several hours after a smaller mudslide overnight left one of the main highways impassable to the north and flooding blocked the road to the south. That meant more residents and children were at home than on a typical day. "I stepped outside my door and heard a noise, almost like a pop," said resident Bill Harbison, who helped rescue two women trapped in the mudslide. "I looked up and I saw the entire mountainside just come down and just race through part of our little town here," he said. Video of the mudslide showed a large portion of a towering bluff break off and then rumble down the hill toward the town, carrying trees, power lines and thick mud into homes below. Several cars were crushed, and a bus was tossed into one of the homes. As the mudslide began, one man shouted, "Get out of here!" Another yelled, "It's coming down!" Residents then frantically ran into the streets, and some quickly helped in rescue efforts. As rescuers worked to find more survivors, they kept an anxious eye on the surrounding hillsides. The search was called off for a few hours overnight as more rain threatened to bring down more of the mountain, but rescue crews resumed their work as soon as it was safe. In 1995, La Conchita was hit by a large mudslide that caused heavy damage. A barrier wall had been built to help protect the town, but the wall appeared to be completely covered in Monday's mudslide. "The retaining wall that's there is very inefficient. It's a small portion of the debris field itself," said Bob Brooks with the Ventura County Sheriff's Department. "When you look at the volume -- I think in '95, when they had the last slide, they were talking about 600,000 tons of sand and mud coming down -- there's really nothing that can stop something of that magnitude. It's almost completely a sheer cliff." CNN's Ted Rowlands, Kimberly Osias and Stan Wilson contributed to this report.